This will be my first official Mother's Day! I was only pregnant with Autumn last year. I have firsthand knowledge of the finger holds, the gassy smiles and now the continuous giggles and bashful smiles they make when you realize they've been stealing glances at you. I feel I have paid my motherly "dues" so I can really appreciate what this day is all about! So, who better to buy my first gift than the Ultimate Mom herself... my mom! I absolutely love it! 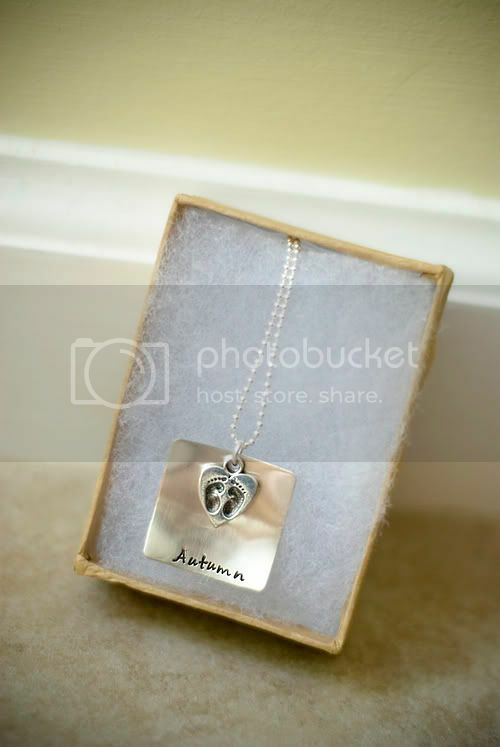 It is a 1"x1" sheet of beveled silver that has been hand pressed with Autumn's name and on the back all the information regarding her birth. The heart charm with the feet is separate and lies perfectly inside the beveled sheet. It is even better than the pictures online depicted. We purchased it from the Etsy Shop AO Designs. We've also had great success and been really pleased with similar items from the Etsy Shop Lilly Ellen Designs. Happy Mother's Day, and thank you Mom! 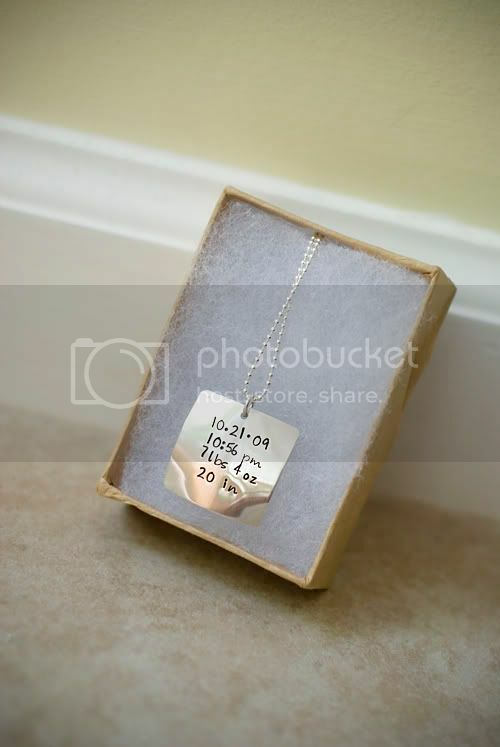 For the necklace, and for everything you have taught me in my 25 years! What a precious necklace! I Love it! So very cute - love it! Very sweet! I love that it has all the stats on the back.